The review relied on statements by Naughten, David McCourt and others as no formal minutes were taken at these meetings. A REVIEW OF the procurement process for the National Broadband Plan (NBP) has found it was not influenced by former minister Denis Naughten or businessman David McCourt. 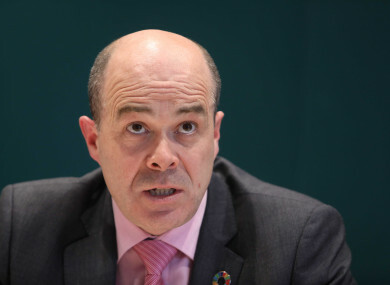 In October Naughten resigned as Minister for Communications, Climate Action and Environment after it emerged he had a number of meetings, including private dinners, with McCourt outside of the procurement process. It was also revealed that the former minister facilitated a lunch in the Dáil for McCourt’s daughter in April this year – and paid for it. The Granahan McCourt chairperson was the last remaining consortium left bidding for the National Broadband Plan contract, worth up to €500 million. The government appointed independent consultant Peter Smyth to review the procurement process and determine whether its integrity was undermined by these meetings. In his report, published today, Smyth said the fact that these meetings with took place outside the process does not mean it has been “tainted”. “I am satisfied that neither the former Minister nor Mr McCourt had the opportunity to influence the conduct of the tender process in favour of Granahan McCourt or otherwise,” he stated. “I also believe that the decision of the former minister to resign, thereby removing himself from the process insulates the process from any apparent bias created by his engagements with Mr McCourt”. However Smyth said he was reliant on statements by Naughten, McCourt and others to verify the content of the meetings because there were no formal minutes taken. Smyth looked at the contact between the former minister and representatives of the consortiums tendering for the NBP. There were four meetings with the Telecommunications and Internet Federation. Naughten also had nine telephone calls with David McCourt. Most were short and coincided with the dates of physical meetings. However one call on 8 August 2018 lasted almost 12 minutes and was made following a senior sponsors dialogue meeting earlier that day. The then minister sent a text message summarising the call to the Secretary General but no formal note were taken. For two of these meetings, Smyth said he was reliant on Naughten and McCourt’s accounts. They told him that there was a short dinner in the Merrion hotel in Dublin on 27 March this year. The focus, they said, was “ALTV and the use of the BOX in Trinity College to train Syrian refugees”. Some of the meetings were public events, like David McCourt’s book launch on 14 May 2018. Five of the meetings were described as being held “in the broader context of enet and or SSE’s business activities in Ireland”. This includes a 2017 dinner attended by Naughten, McCourt and Minister Pat Breen in Clare. Naughten welcomed the report’s publication “not only for myself but for the 1.2 million people in rural Ireland waiting to be connected to high-speed broadband”. My sole objective throughout this process, during my time as Minister, was to deliver much promised broadband to rural Ireland. Naughten said delivering high-speed broadband to homes, farms and businesses “should now be the only goal of our government and members of Dáil Éireann”. A spokesperson for National Broadband Ireland also welcomed the report’s findings. They stated: “The report confirms what we have always stated, which is that at no stage did either Mr McCourt or Granahan McCourt influence the tender process in favour of Granahan McCourt or otherwise and any engagements with the Department have always been in the sincere interest of supporting investment in rural Ireland which the National Broadband Plan represents. National Broadband Ireland has been committed to the National Broadband Plan (NBP) since the first days of consultation and will continue to fully support the Department with its procurement evaluation. Speaking to reporters earlier, Minister for Communications, Climate Action and Environment, Richard Bruton said the report finds that having “side meetings in a tender process that haven’t been minuted could give rise for concern”. However, the minister said Smyth looked at whether the meetings could have damaged the process, and concluded they could not have. Bruton said Naughten was found to not be privy to information that could have influenced the outcome. The minister said that although there was “cause for concern, the cause for concern was not a substantive one”. The fact Naughten stepped down had removed any question of bias. He said it was the right decision by Naughten to step aside. Commenting further on the publication of the report, Bruton said the procurement team has been evaluating the tender received by Granahan McCourt. “This will lead to a recommendation to Government as to whether or not to appoint the Granahan McCourt led Consortium as preferred bidder in the National Broadband Plan State led intervention procurement process having regard to matters including the maximum subsidy required. “Since my appointment, my priority has been to bring this process to a fair and impartial conclusion as quickly as possible. “It’s not a new consortium, it’s a consortium that changed over time,” prompting laughs from the opposition benches. The Taoiseach also said that there were two auditors evaluating the final bid, submitted on the 18 September, and that “off the top of his head” he understood one of these to be KPMG. The result of this assessment would be given in the coming weeks, he added. There is now a question mark hanging over the timeline for the delivery of broadband to the 500,000 homes who are still without broadband. Bruton said the proposal from the remaining tender is still under consideration and a report is due to be delivered to him shortly. Only after a government decision is made as to whether to proceed, can timescale on the delivery be taken. He said he was “not going to be preemptive” and stated that the government were going to state it will “deliver X, Y and Z” by a certain time, when a decision on the tender is still to be taken. Email “Denis Naughten welcomes report which says broadband plan 'was not tainted' by dinners ”. Feedback on “Denis Naughten welcomes report which says broadband plan 'was not tainted' by dinners ”.